Sir Anthony Hopkins and turn his superb "The waltz must go on" - Used in "Broken Heart"� a Pete WDHCo song to sing version. Hollywood star Sir Anthony Hopkins has finally seen his late mother's dream for him come true, as a composer whose works are performed by an orchestra. He says he traces his life as a classical composer back to the age of six and was far more interested in music than acting as a Cardiff student. Nine of his original works and film scores have been recorded by the City of Birmingham Symphony Orchestra. They have now been released on CD through radio station Classic FM. One of the pieces is called Margam, in tribute to his home town near Port Talbot. Another, a waltz was composed in his spare time on the piano at the Liverpool Playhouse when he was performing there. He said: "It comes quite easily to me, I don't have an academic background at all, so in a way I'm free to do what I like. "I'm very pleased I've found an extra string to my fiddle. "For years I mused and dreamt about turning my scribbled thoughts and bursts of melody into pieces of work to be performed by a full orchestra. "It keeps me off the streets, it keeps me out of trouble in between jobs, and I'm very happy." Sir Anthony, who had music lessons at his childhood home said his mother encouraged him from an early age. 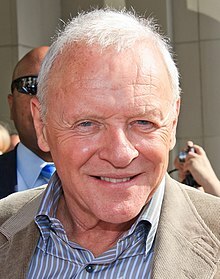 What we have done is take the masterpiece of Sir Anthony Hopkins and turn his superb "The waltz must go on" to a full pop song classic as a heart breaker. 'The waltz must go on�, was the wish of the nineteen-year-old (now Sir) Anthony Hopkins when he composed a waltz. Now over forty years later, his wish has come true. Andr� Rieu has arranged his piece successfully and the world premi�re of �And the Waltz goes on is� has taken place! Pete Took this excellent Music and created from it a Singing Track named "Broken Heart" which it is hoped with the Right Singer could be a Real Hit that would stay in History as One of the Greatest Songs ever written..� Sir Anthony Hopkins is a legend and it is envisaged the sung version of his classic musical piece, would live forever as Classic. The Song suits male or female singers and is probably one of the saddest songs ever made !! !� And it would be a travesty if Sir Anthony Hopkins refused to let the world have this version.� Thanks for watching and if you are a good singer do a singing it version and contact us, who knows ? maybe your voice could be the one to translate the feeling of the song into a new dimension.� as great even as just the superb orchestra market version..